You can login to client area and download. Simple overwrite the old theme. We converted whole site and it now supports Bootstrap. So it’s easy to customize site, reduce size, load faster. You can see our demo, it loading very fast, click and show. Improve css, js, images, html code, WP Query code… Remove unused stuff. Bundles Deals: you can create a bundle of deals, make it a seperated deal. Report filter: help you search & get the result on report page instantly. Fix issues with unicode characters on PDF voucher. Fix issues with guest checkout. Fix issues with responsive version. Support bootstrap now. Fix HTML design, css for the theme. 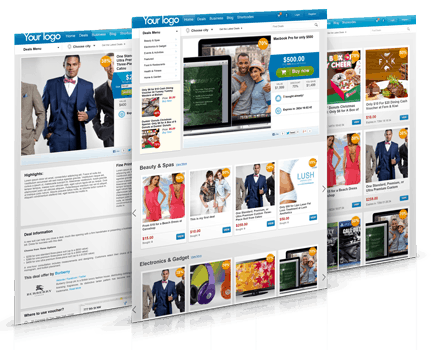 We now combined WPGroupbuy Plugin to WPGroupbuy Theme, you don’t have to run plugin, theme seperately. Just need to active WPGroupbuy theme v2.3 and done. System won’t generate lot of data on database anymore. Your database will be smaller and site will load faster. More payment methods: Mollie.nl, PayU India, MercadoPago, Authorize.net CIM and more offline payment gateways such as Cash on delivery, Cheque, Bank wire transfer. More than that, you can choose your own design for checkout button. Adding deal options feature. Client now can choose options of your deal easy. It works like Groupon website. Can turn on/off Guest checkout. Can turn on/off Merchant account. Remove lot of bugs with WordPress v4.x (Debug mode on) and issues found on error log file. Remove issues with generate content automatically on database. Remove issues with checkout process, empty cart when checkout. Remove issues with report, account page. Fix issue when reviewing voucher. Fix issue with Facebook login. Fix thumbnail display. We now remove timthumb. We would like to announce the license renewal is now $0 instead $49.99/year. You won’t pay any fee for license, we have upgraded all licenses to Lifetime so you can use it forever. We hope you are happy with this news. Improve css, js, images, html code, WP Query code… we made site load faster. Remove unused stuff. Improve subscription lightbox feature, you can close the lightbox and skip submit information. More payment methods: Stripe, eWay (for Australia, New Zeland customer). Allow you add more fields on registration form (require coding, for advanced use/developer). Allow you increase sales/purchases with a fake number. Add Deal menu: you can add your own deal menu, it supports sub-menu as well. Offline license file: allow you upload license file, keep it offline checking. So your site will not depend on our server. If we have any trouble with server, your site won’t be affected. Add phone, email field on billing, shipping form. Fix issue for ‘How do you want to show Deals’, you won’t be redirect to login page when option ‘Visitor can see the deal but they need to login to get more details’ choosen. Fix issues with Child Theme, now you can use customizer tool. Fix issues with responsive version. Support responsive for embed video. – Offline payment method: Now you can use HTML code on instruction field, fix display issue. – Fix issue when you customize sub-menu background color. You just need delete old theme version and active new version v2.1.1. If you have customized code, please backup and test your site first. By working with css, js, images, html code, WP Query code… we made site load faster, smaller files. Remove unuseful stuff and site is now use less resources. We made big change of timthumb by changing its URL slug, no more complex URL, it now shorter, load faster. We also improve the checkout process, you can choose multiple payment method and checkout easy. API: allows you customize site as you want, you can now add your own payment gateway. You need to contact us to get document about API. Allow merchant edit their own deal, they can change status of deal to pending or publish. Subscription lightbox: When you first visit a deal site, you will be asked for choosing location, enter email. Now WPG supports it, you can turn it on/off easy. Set shipping fee based on cart. SSL error when checkout as guest. Show active deals on featured position only. Fix thumbnail display on some pages. Add upload form for some section on admin panel. Voucher code page now supported responsive version. Add checkbox ask client accept term of service when checkout. Some HTML design, css for the theme. Fix empty error when choosing featured category. We want to inform that own website & products will change the name. No more WPGroupon, it will change to WPGroupbuy and new URL is http://wpgroupbuy.com. We have trouble with ‘groupon’ term and that is the reason why we need to change. We are now changing the site and reconfig it, if you get any trouble, you can send an email for support.